GL2CLOUD GL2CLOUD. Terms and Conditions. Please note that additional terms and conditions shall apply to the specific Product or Service that you purchase from Gold Line. To view the terms and conditions of the GL2Cloud Services, please view COLOCATION SERVICES SCHEDULE. (c) Theft or Unauthorized Use of Products and Service. You shall not use or obtain the Products or Service in any manner that is contrary to or avoids Gold Line policies and procedures, including in an illegal or improper manner. You shall notify us immediately, in writing or by calling our customer support line, if you become aware at any time that a Product or Service is stolen, fraudulently used or otherwise being used in an unauthorized manner. When you call or write, you must provide your account number and a detailed description of the circumstances of the fraudulent use or unauthorized use of the Product or Service. Failure to do so in a timely manner may result in the disconnection of your Product or Service and additional charges to You. Until such time as we receive notice of the theft, fraudulent use or unauthorized use, you will be liable for all stolen, fraudulent or unauthorized use of the Product or Service. Gold Line reserves all of its rights at law and equity to proceed against anyone who uses the Products or Services illegally or improperly. (d) Prohibitions. You agree that You will not alter, modify, adapt, create derivative works, translate, deface, decompile, disassemble or Reverse Engineer the Contents, or attempt to do so, or permit, acquiesce, authorize or encourage any other party to do the same. For the purpose of this Agreement, “Reverse Engineer” includes any act of reverse engineering, translating, disassembling, decompiling, decrypting or deconstructing (including any aspect of “dumping of RAM/ROM or persistent storage”, “cable or wireless link sniffing”, or “black box” reverse engineering) data, software (including interfaces, protocols and any other data included in or used in conjunction with programs that may or may not technically be considered software code), service, or hardware or any method or process of obtaining or converting any information, data or software from one form into a human-readable form. (e) Geographical and Other Restrictions. Gold Line may, from time to time, based on local laws or otherwise, update these Terms and Conditions to provide limitations on the countries and/or carrier networks in or on which the Contents may be installed and/or used. (a) Third-Party Content and Websites. The Website may contain links to websites that are not owned or controlled by Gold Line. Gold Line assumes no responsibility for the content, privacy policies, or other practices of third-party websites. You are encouraged to read the terms and other policies of such websites. By using the Website, You agree that Gold Line shall not be liable in any manner due to your use of any third-party contents or website. In addition, Gold Line will not and cannot censor or edit the content of any third-party site. By using the Website, You expressly relieve Gold Line from any and all liability arising from your use of any third-party website. (b) Transmission of Personal Data. 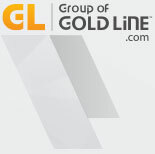 You acknowledge and agree that by providing Gold Line with any personal or proprietary user information through the Website, You consent to the transmission of such personal or proprietary user information over international borders as necessary for processing in accordance with Gold Line's standard business practices. You should be aware that linked websites may contain transmission of personal data provisions that differ from the provisions provided herein. Gold Line is not responsible for such provisions, and expressly disclaims any and all liability related to such provisions. (c) Nature of Content. The Website is not intended for use by children under the age of 13. (e) Downloads. All Content (including software, if any) that is made available to view and/or download in connection with this site, excluding Content and/or software that may be made available by end-users through a communication service, is owned by and is the copyrighted work of Gold Line and/or its suppliers and licensors and is protected by copyright laws and international treaty provisions. Your use of the Software is governed by the terms of the software license agreement, if any, which accompanies or is included with the Software ("License Agreement"). You may not install or use any Software that is accompanied by or includes a License Agreement unless You first agree to the License Agreement terms. In the event that any Software is not accompanied by a license agreement, it shall be governed by these terms and conditions. You further agree that You will not download any content or software without complying with all applicable use controls, laws and regulations, and You warrant that You will not download any content or software where such downloading is prohibited by local laws. (f) Use of Personal Contact Information Provided. Gold Line may use the personal contact information collected from You (such as email address, telephone number of postal address) to contact You for customer service and survey purposes. We may also use your contact information to send You marketing or promotional materials. You may opt out of receiving promotional and/or marketing materials by following the “Unsubscribe” link once You receive the first such communication from Gold Line. (c) NEITHER GOLD LINE NOR ITS AFFILIATESSHALL BE LIABLE FOR ANY DIRECT, INDIRECT, INCIDENTAL, SPECIAL OR CONSEQUENTIAL DAMAGES ARISING OUT OF THE USE OF OR INABILITY TO USE THE WEBSITE, EVEN IF SUCH PARTY HAS BEEN ADVISED OF THE POSSIBILITY OF SUCH DAMAGES. (d) GOLD LINE’S TOTAL LIABILITY TO YOU PURSUANT TO THE TERM OF THIS AGREEMENT SHALL BE$100. (e) THIS LIMITATION ON LIABILITY INCLUDES, BUT IS NOT LIMITED TO, THE TRANSMISSION OF ANY VIRUSES WHICH MAY INFECT A USER'S EQUIPMENT, FAILURE OF MECHANICAL OR ELECTRONIC EQUIPMENT OR COMMUNICATION LINES, TELEPHONE OR OTHER INTERCONNECT PROBLEMS (e.g., YOU CANNOT ACCESS YOUR INTERNET SERVICE PROVIDER), UNAUTHORIZED ACCESS, THEFT, OPERATOR ERRORS, STRIKES OR OTHER LABOUR PROBLEMS OR ANY FORCE MAJEURE. GOLD LINE CANNOT AND DOES NOT GUARANTEE CONTINUOUS, UNINTERRUPTED OR SECURE ACCESS TO THE WEBSITE. (f) WITHOUT WAIVING THE EXCLUSIVE GOVERNING LAW CLAUSE BELOW, SOME JURISDICTIONS DO NOT ALLOW EXCLUSION OF IMPLIED WARRANTIES OR LIMITATIONS OF LIABILITY FOR INCIDENTAL OR CONSEQUENTIAL DAMAGES, SO THE ABOVE LIMITATIONS OR EXCLUSIONS MAY NOT APPLY TO YOU. IN SUCH JURISDICTIONS, THE LIABILITY OF GOLD LINE AND ITS AFFILIATES SHALL BE LIMITED TO THE GREATEST EXTENT PERMITTED BY LAW. (g) Indemnity. You agree to defend, indemnify and hold harmless Gold Line and its Affiliates from and against any and all claims, damages, obligations, losses, liabilities, costs or debt, and expenses (including but not limited to attorney's fees) arising from: (i) your use of and access to the Website or Contents; (ii) your violation of any term of these Terms and Conditions; (iii) your violation of any third party right, including without limitation any copyright, property, or privacy right. These defense and indemnification obligations will survive these Terms and Conditions and your use of the Contents or Website. (a) Notices. Notices by Gold Line to You may be given by means of a general posting at the Website. Notices (including questions, complaints, or legal notices) by You may be given by electronic messages or conventional mail, as follows: (i) Electronic mail (e-mail) must be sent to customersupport@glsip.com ; (ii) Mail and courier deliveries must be sent to: Gold Line Telemanagement, Inc., 300 Allstate Parkway, Markham, Ontario L3R 0P2, Canada. (f) Assignment. You may not assign your rights and obligations hereunder. However, Gold Line’s rights and obligations are fully assignable. (j) Violations. Gold Line reserves the right to seek all remedies available at law and in equity for violations of these Terms and Conditions, including but not limited to the right to block access from a particular Internet address to the Website. Gold Line reserves all of its rights at law and equity to proceed against anyone who uses the Services illegally or improperly. (k) Survival. The provisions of this Agreement relating to indemnification, limitations on liability, warranty limitations and disclaimers, resolution of disputes, billings and your obligation to pay for the Products or Services provided and any additional usage charges, shall survive the termination of the Agreement and the termination of the Services. (l) Arbitration. Other than any dispute that qualifies for small claims court, any dispute or disagreement of any kind between You and Gold Line shall be resolved by binding arbitration in accordance with the laws of the province of Ontario and the Arbitration Act (Ontario), which is deemed to be incorporated by reference into this clause, as modified or supplemented under this Section. The arbitration tribunal shall consist of one arbitrator. The decision of the tribunal shall be final and binding and no appeal shall lie therefrom. The tribunal shall have the power to order one party to contribute to the reasonable costs and expenses of the other party, or to pay all or any portion of the costs of the arbitration, as the panel determines in its discretion. Note however, that before You take a dispute to arbitration or to small claims court, You must first contact our Customer Care Department representative at the customer service number on your Gold Line invoice for the Products or Services, or write to us at the following address and give us an opportunity to resolve the dispute: Gold Line Telemanagement, Inc., 300 Allstate Parkway, Markham, ON L3R 0P2, Attention: Legal Department. You must describe your dispute and provide Gold Line with any supporting documentation. Likewise, if Gold Line has a dispute with You, it will notify You by letter sent to your billing address and attempt to resolve it before pursuing litigation or arbitration. (m) Governing Law/Forum Selection. These Terms and Conditions are governed by the laws of the Province of Ontario to contracts made and performed solely in the Province of Ontario, without regard to conflict of laws principles. © 2014 Gold Line Telemanagement, Inc. All Rights Reserved.